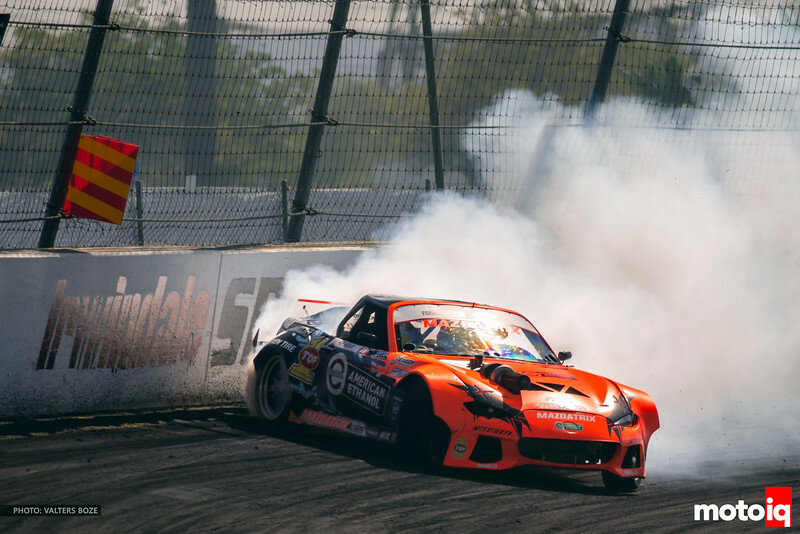 In sea of V8 swapped cars in the pro drifting world, the Mazda MX-5 of Kyle Mohan stands out as a bold statement of uniqueness and technical innovation. It is currently the sole rotary engine running in Formula Drift. A rotary can be a formidable engine in many forms of competition as it has to potential for great power density, making a lot of power for its weight and size. However pure power is not the most important requirement for drifting. Drifting requires brute power but it also requires a lot of torque and a wide tractable powerband. It also requires good throttle response as drifting it a sport that mixes brute force with delicate levels of control. Sort of like figure skating with hockey players. In this regard, a big displacement V8 does pretty well. That’s all good but Kyle’s company, KMR or Kyle Mohan Racing is based around building and supplying parts for the Mazda Rotary engines so Kyle runs a Rotary as a rolling R&D lab for KMR. Over the years Kyle has developed the rotary from being a high strung bomb that made great power to a viable reliable engine that makes competitive power and holds together well. Kyle’s chassis is a 2014 NC MX-5 which has been updated with 2016 ND bodywork. Never one to do the usual thing, Kyle’s MX-5 is a short wheelbase car which bucks the trend for successful drift cars having longer wheelbases for more stability and for putting down the power out of the turns better. The widebody kit is a custom built part available through KMR. The cars looks are done with a wrap by Wrap Legends and AW Graphics. The engine bay is where most of the tech and innovation reside. The engine is a 2-liter three-rotor Mazda 20B which was found in the Japanese market Cosmo. The KMR built engine makes over 1000 hp at 10,000 rpm on 37 pounds of boost. With Kyle’s current formula, the engine has been stone reliable and he ran the entire 2018 season on the same engine. The heart of the engine is relatively stock with standard Mazda rotors and eccentric shaft. The rotors are modified to take KMR 2mm thick unbreakable apex seals. KMR gets rid of the stock tension bolts that hold the engine together than replaces them with special oversized 0.5″ ARP studs with the housing holes precision reamed to accommodate them. This way the clamping force to hold the engine together can be increased and the studs act like dowels to keep the housings from moving under the extreme pressure that 37 pounds of boost can create. The rotor side housings are ported with KMR’s proprietary port pattern to increase the flow of the housings and to add to the port timing. The rotor housing exhaust port is also enlarged. In a rotary, this is the equivalent of porting the head and getting a cam. Stock Mazda bearings are used but they are polished and WPC treated for longer life. In fact, the engine makes extensive use of WPC treatment on all metal moving and rubbing parts and it is one of the reasons why this mega boosted engine has such a long service life. 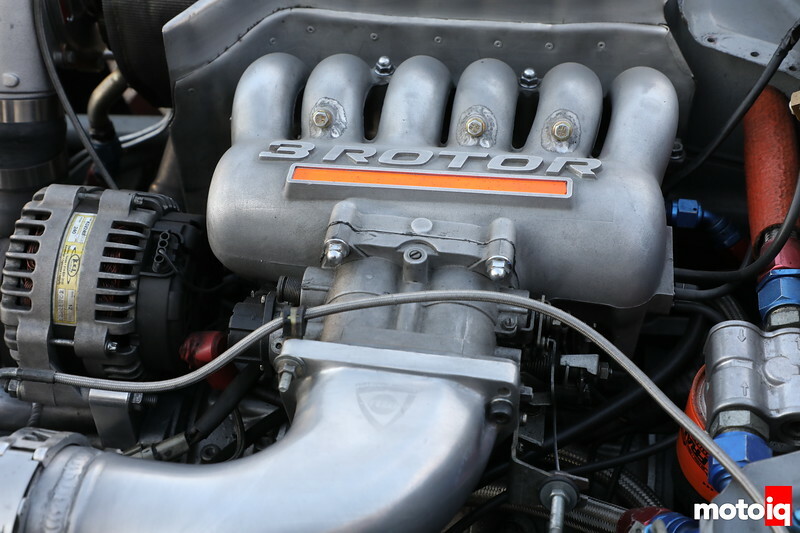 The stock intake manifold and throttle body are used. In fact, much of the engine is stock. For power and long life in a rotary, its the details and specs of how you do things rather than a bunch of trick parts that makes for power and longevity. It is hard to see in this picture but the engine is fed 98 percent American ethanol fuel blended by Thunderbolt racing fuel through a CX Racing fuel rail and 2200cc Deka injectors sourced from Evolved Injection. This car really needs a Power Distribution Module (Motec, Ecumaster, Racepak). Wow, that thing must scream like a banshee at 10K rpms. Going to dig into this more later, but any issues with premix on rotor housing lubrication with ethanol? I’ve seen some anecdotal evidence from people who had housing damage on E85 that worries me. I am pretty sure that Kyle uses an alcohol specific premix oil, I think its made by redline. I had that discussion with him a couple of years ago and kinda forget the specific oil now. I asked Kyle and he says he uses Motul Nitro RC car lube. What kind of benefits are seen from the Wisefab kit, is it worth it for a weekend track car if the funds are there? You can lower the car a lot without messing up the geometry although its not exactly a bolt in, you need to swap to a BMW steering rack and modify the cross member for it. It is also more for drifting with a lot of steering angle. I do like the everything and the kitchen sink approach. Lag? Use anti-lag and NOS. Knock? Use ethanol and water injection. If the throttle is closed, is there any chance of the intake air being blown into the exhaust flowing back upstream into the engine? No, there is positive pressure there. Amazing coverage Mike. You seem to be one of the few that actually explains the tech behind the work. Very, very enlightening. OK, digging into this a bit more, finally. I don’t expect confirmation but looking at the power per boost I suspect street ported of some description, which wouldn’t be totally surprising in a “keeping all the gasses moving in the right direction” sort of way. I find it interesting that the old Mazda dry sump cover is up to the task for a 20B, though I suppose there is a version with bigger gears for more flow. When NGK surface discharge plugs get brought up, are they the standard Mazda race plugs or something different? I tried chasing that once with Champion surface gap plugs and never got anywhere useful. Looking at the turbo setup, the backpressure reducing wastegate is funny – does FD have noise restrictions? It just seems a weird way of dealing with that. I also wonder if a lot of the hardline going to turbo components is going to eventually have fatigue issues, as it looks like it’s connecting between the chassis and engine. It seems like there’s various capped off bungs and stuff… between that and the variety of stuff going on (antilag, nitrous, water injection) it seems like there’s some extent of trying to have multiple options going on to home in on what’s “best” perhaps; will be interesting to see if the RX-8 retains all of them. This sounds kinda weird but I feel like the rest is kind of “cut and dried”, though I do wonder how much Megan Racing is in those custom valved Megan Racing shocks if you get my drift. I also kind of feel like someone should do a decent LSD for the Winters QC, though I suspect that everyone’s engineers have gotten used to setting up around the spools.